The Royal College of Occupational Therapists is the largest body of occupational therapists in the UK with over 32,000 members and 14,000 website users. They promote the values and benefits of occupational therapy to the public, service commissioners and political representatives. Their website acts as an essential hub for access to professional information. There is public access to vital service information specifically for young people, physically and mentally disabled, and older people. Members of RCOT can also find additional medical documentation and the latest research. 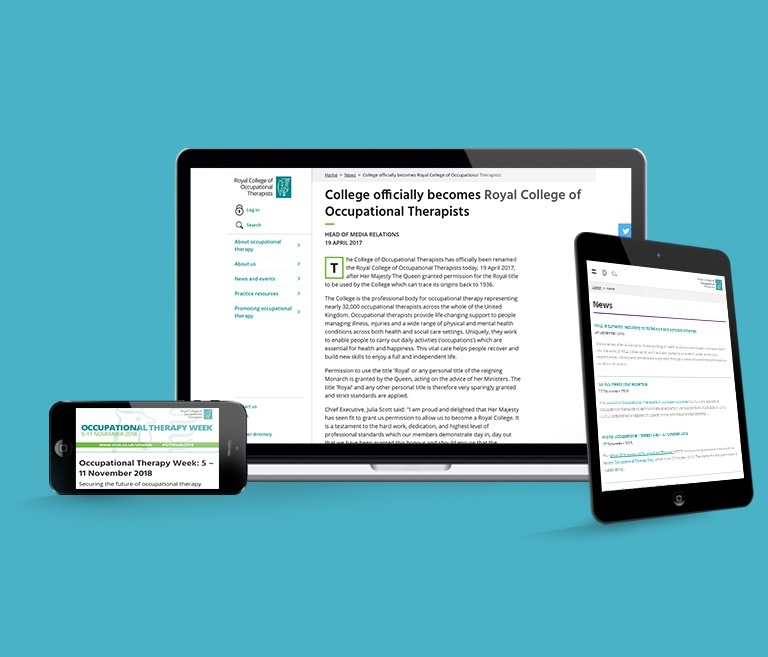 Royal College of Occupational Therapists (RCOT) wanted their site to be an indispensable online resource for members. RCOT approached CTI Digital to help them streamline and update their historic and unresponsive site, but were afraid that losing content meant losing traffic. Retire, refresh and recycle site content. Retain positive user experience, by redirecting existing users to the newly improved site. Increase organic traffic, presenting RCOT as an authoritative resource and encouraging membership signup. These took place alongside a migration and entire site redesign, which you can read about in the full web development case study. Alternatively, read on for the specific SEO digital roadmap. SEO was at the forefront of the site build as we worked in conjunction with the client and development team to create a site to increase organic visibility. As the site had many contributors over the years, through all COT members, it had become extremely large and unusable, with thousands of pages. These pages contained valuable resources for members. These pages were being accessed organically. These pages were linked to from external domains. If none of these criteria were hit, a decision would be made to drop these pages. Content would then be migrated from valuable pages and 301 redirects applied to the new URL on the new site. As the site had never previously had any SEO work conducted, it was important to begin with a thorough keyword research period. Using these insights we redrafted and rearranged much of the site's content. We created a content map, which was invaluable during the redirect period, to draw connections between relevant topics. Priority pages were identified and updated, with the site’s architecture and hierarchy reorganised. Beyond the on-page content, the meta titles and descriptions (which appear on search engine results pages) were all given a keyword boost. This allows both users and search engines to clearly see the focus of each page, and encourages click throughs. As with most not-for-profit organisations, RCOT hosts a large number of events throughout the year. To simplify promotion of these campaigns, we added structured data markup to event pages. This was a key opportunity that the historical site could not support. Adding Schema coding to a page enables search engines to pull through the most relevant details. This provides a user with rich snippets of information, such as time, date and location, directly on the search engine results page. After months of development and just weeks prior to site launch, the Queen approved the college's Royal status. This meant that the college would now be known as the Royal College of Occupational Therapists. We took this opportunity to migrate to rcot.co.uk from cot.co.uk, rather than launching the new site and then moving domain at a later date. During the build period, we also encountered unforeseen SEO issues relating to the historic online presence of the college. The college had formerly been known as the British Association of Occupational Therapists, existing at baot.co.uk. This site was still live and an exact replica of the cot.co.uk site, the college was accidentally organically competing against itself. Redirects from BAOT were also required to the new RCOT domain. The evolving name of the organisation presented a challenge but also a useful opportunity for link building. A strong link profile can boost the authority and ranking of a website. Once we had identified the legacy COT and BAOT domains, we performed a full link audit, to note any broken or toxic links that could damage the authority of the site's profile. These links were no-indexed to prevent associations with the new RCOT site. More than removing negative links, we also sought out historic links to BAOT that could be productive. Pre-existing backlinks were changed, in order to boost the new domain during its early period. 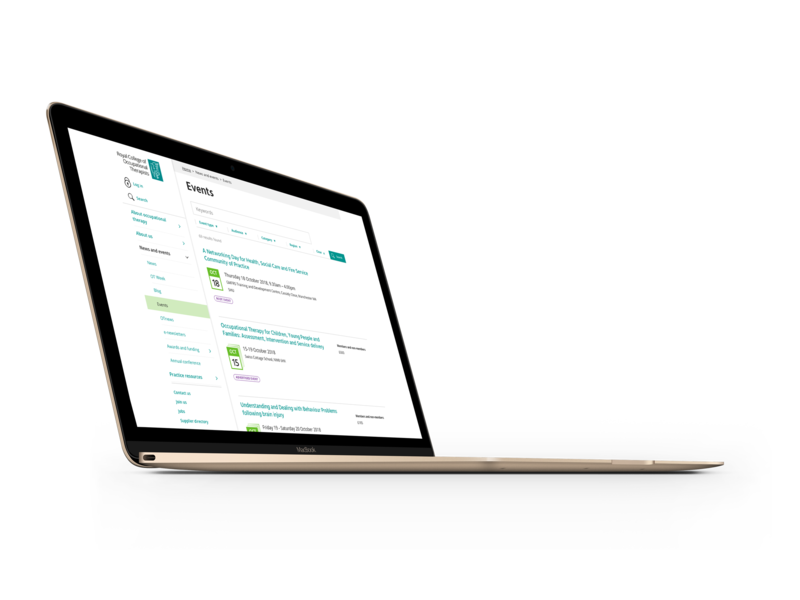 Since launch we have continued to work with RCOT to ensure the website continually improves upon the initial launch inline with the digital roadmap, across development and SEO. We have seen significant increases to key user metrics since launch. In the first six months after launch, total users grew 16%. These users were also engaging with the site at a significantly higher level, with total page views growing 55% and page views from organic visits rising 51%. The new site build and collaborative SEO project has resulted in a year-on-year increase in mobile traffic from organic channels by nearly 50%. The added mobile usability also resulted in a year on year rise in organic users of 11% whilst receiving exceptional usability feedback from the college’s members. Check out the RCOT website for yourself.